Obesity is growing problem, estimating that about one-third of all dogs are either obese or overweight. There are certain breeds that are at risk for obesity, like Labrador, which one of the main breeds vets see coming into their clinics who suffer with weight problems. There’s a growing trend of pet owners who are beginning to realize the important of basic health decisions when it comes to their pets, and decreasing toxicity is one of those fundamentals. Taking control over your pet’s health with the natural health solutions that can give your pet amazing a vibrant health. 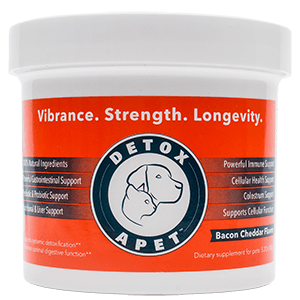 A clean and detoxified body is the solid health foundation you want for your pet. Take control today! All of the medical conditions are avoidable and highly preventable. And when your companion pet is of a healthy and fit weight, it saves you money in huge vet bills which you encounter due to your pets obesity. When your pet is classed as obese, you know the suffering that comes with your pet being overweight. Problems with their joints, struggling to walk, suffering with breathing with the excess fat around the throat area, risk of heat stroke in hot weather. There are different reasons why our dogs and cats get overweight. Today’s pet lifestyle and diet contributes to a sluggish metabolism, and they many times become unable to detoxify and remove toxins and fat. A lack of exercise, and a lack of knowledge in terms of the diet and nutritional choices you are making are also a huge problem for your pet. Especially when you consider how much toxicity your pet has had to endure in its life. From the vaccines, the medications, spot of products for ticks and fleas, flea collars, lawn and garden chemicals, toxic heavy metals, etc, your pet has probably never had the proper nutrition that takes all this toxicity in consideration. In fact, cancer will now affect 50% of all dogs, this is alarming when you consider that few vets know about the toxicity issue in pets. Know what type of food you should give your pet, how much you should be feeding and the amount of calories that are the different types of food have, as well as treats. Unfortunately, many people feed human food and scrap and don’t take this into account when feeding them their daily rations that they then need to feed them less. Once you’re aware the your pet’s obesity and health problems, stay on the smartest nutritionally sound diet, while giving them the natural support their body is dying for. Feed them a set amount per day, and weigh them often.